Braum's for lunch again. I like their tea. Welcome to another edition of Frizzy Hair Friday. Actually I think my hair looks okay today. Anyway. How's everyone been? 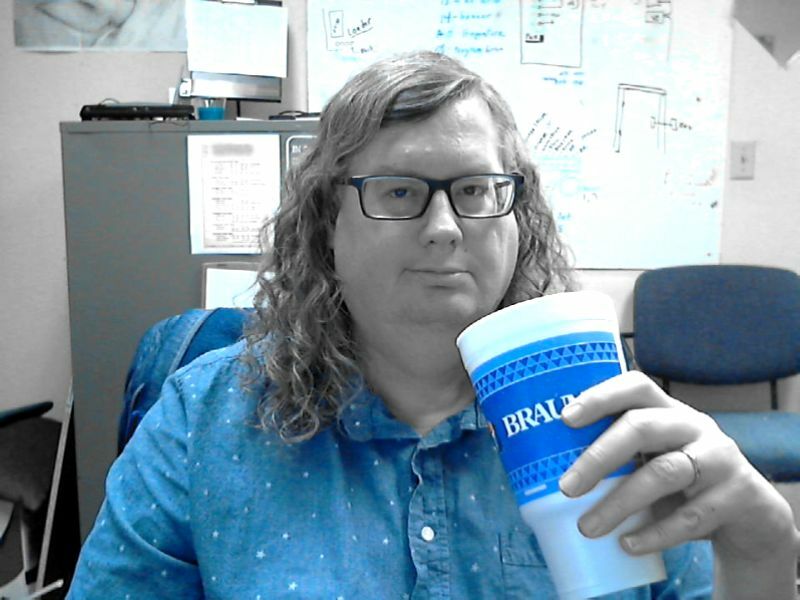 I know it's been a few weeks since I've done a Frizzy Hair Friday post, but not much has been going on. I've been going to work, returning home, and sleeping. Exciting, yes? This morning was my regular A1C test and checkup. I haven't gotten the results back yet, but I'm hoping for anything below a 7. My blood pressure was good, but my weight was up about 5 pounds. Well I have been a bit of a lay about for the last couple of months. So I guess it's to be expected. I've been listing to quite a bit of classic rock this week. When I get home after work instead flipping on the TV, I've been asking our Google Home to play any album name I can remember. Last night was Supertramp's Crime of the Century. A great album. So while I at the office this morning I thought I'd fire up Supertramp's Breakfast In America. Another great album. In fact, I highly recommend both albums. Please check them out. Well anyway, I wanted to get a closer look at the Breakfast In America album cover. I've only ever seen it as a cassette cover or as a thumbnail in iTunes & Spotify. It's a very creative album cover. The view is from an aircraft window over looking what looks like New York City. Instead of the Statue of Liberty, it's a dinner waitress holding a glass of orange juice where the Liberty's torch would be. The city skyline is made up of breakfast table settings instead of buildings. At the top is written the band's name in large white transparent gradient text. While searching for the album cover I stumbled upon something strange. Apparently there was a 9/11 conspiracy theory about the Breakfast In America album cover. This was very odd considering the album came out in 1979. So basically the artist of this album cover is part of a conspiracy by the Illuminati or Freemasons in the late 1970's. All because the orange juice is over the World Trade Center representing flames. The transparent gradient of the U and P in Supertramp are right over the same buildings, and when mirrored look like a 9 and a 11. Well enough of this rabbit hole, back to work.